I tried the quiz with a small class of pupils who have previously been known to have behavioural issues. The quiz format worked really well for them, they helped each other out a bit with some questions, but all tried to make sure they were still winning. It was a close fun thing with the range of scores being only 4! I enjoyed running the quiz and they enjoyed participating. The all revised topics they haven’t covered for a while and going through the answers has meant they all can now do things that will more than likely come up on their exam that they couldn’t before! all in all, a successful and enjoyable lesson was had by all. 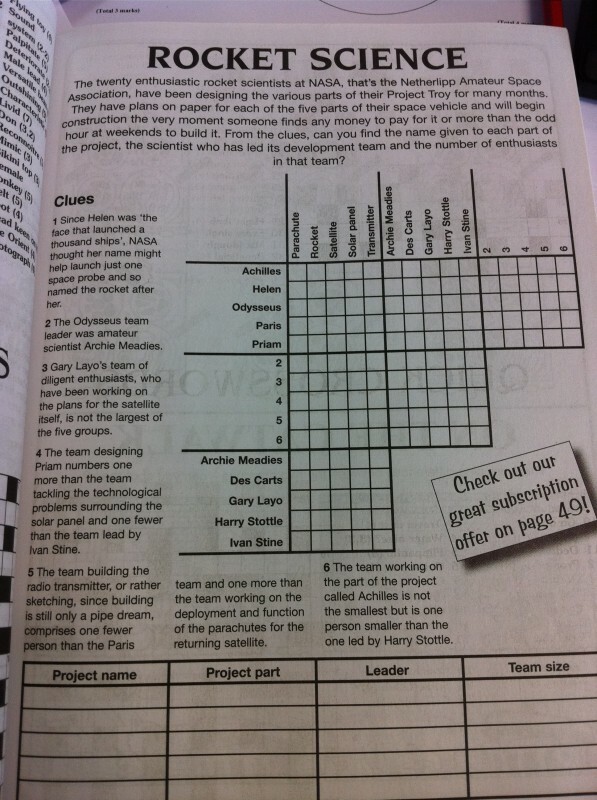 I think I will run similar quizzes next week for them and for my other Y11 classes. I also enjoyed the many number puzzles such as ken kens and sudukos. I think it was these puzzles at a very young age that might have been the first indicators of my love for maths. 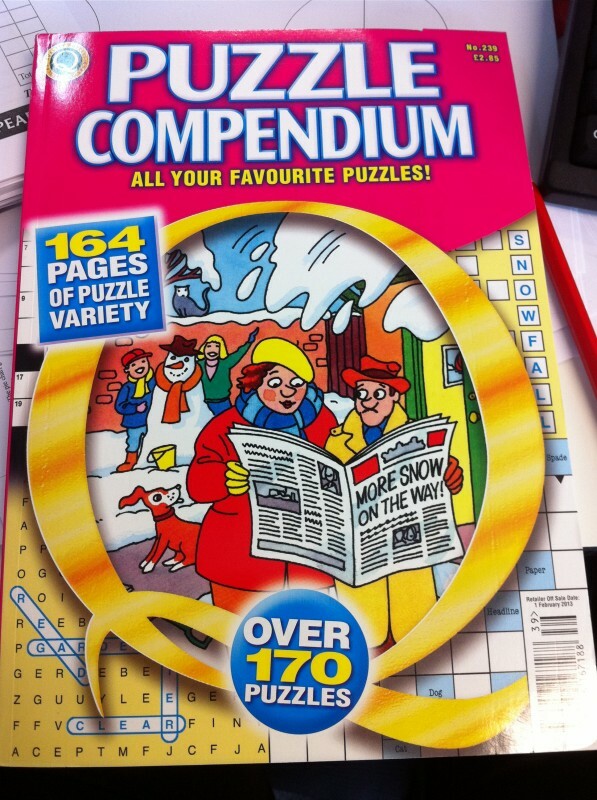 When I came across this compendium a few weeks ago I immediately looked for and completed a logic puzzle. While I was doing so I realised that the reasoning being used was quite mathematical and that the able i was filling in was basically a two-way table. I decided that this would be a nice starter activity and so I made a purchase. Which reminded me of my compendium! I have used Emily’s this week as a starter for a few classes and they loved it, so I am going to incorporate more of these in future lessons. I’ve used it with a variety of classes from KS3 – KS5 and all enjoyed it, the faculty members i gave it to also seem to enjoy it too! Currently my further maths class are revising for tomorrows D1 exam. Due to the fact we changed the order of the modules we teach the year 12s are also revising for the same exam and I have my class last lesson on a friday at the same time my ATL has year 12, so over the ast few weeks we have been joining up for the last 20 minutes or so and facing of in a head to head “pub quiz” type revision event, these quizzes came from the ATL. They worked really well, helped consolidate some of the learning and gave the students chance to see where they needed to put more work in. In this vein I have made a C1 and a C2 quiz ( http://www.tes.co.uk/teaching-resource/Core-1-and-2-revision-Quizzes-6334839/ ). The C1 quiz went really well and I am going to run the C2 quiz for the first time tomorrow. Given the success of these quizzes I am planning on doing some similar ones for GCSE classes next week! Edit – 09/12/13 – I have added some new rounds to the C1 quiz and have also uploaded exported ppts for those of you unable to access notebook. Inequalities is a subject that I enjoy teaching, it is one which easily lends itself to SMSC discussion around inequality in society and it is quite a fun topic to do. The lesson starts with a few pictures of different inequalities and I ask the class if they know they word and if they can tell me what it has to do with the pictures I have put on the board. This can produce some lively debate and often some brilliant answers about social inequality and how unfair that can be. I then introduce the signs and discuss what they mean and the difference between them before moving on to some questions which pupils need to answer on whiteboards. These start with easy numerical ones before moving on to some sums. I include one where they get 4 and 4 and have to put a sign in. Most put one of the “or equal to” ones but there’s always one or two who opt for = despite it not being on the list. I think this is a great discussion point to use with pupils. As it gets further on I throw a couple of fun ones in. Most pupils get Maths > English correct (thankfully), but most get Rugby > football wrong! The lesson moves onto numberlines and writing integers which satisfy inequalities and then refers to a card sort activity which involves pictures showing inequalities on a number line, integers which satisfy the inequality and the inequality written algebraically. 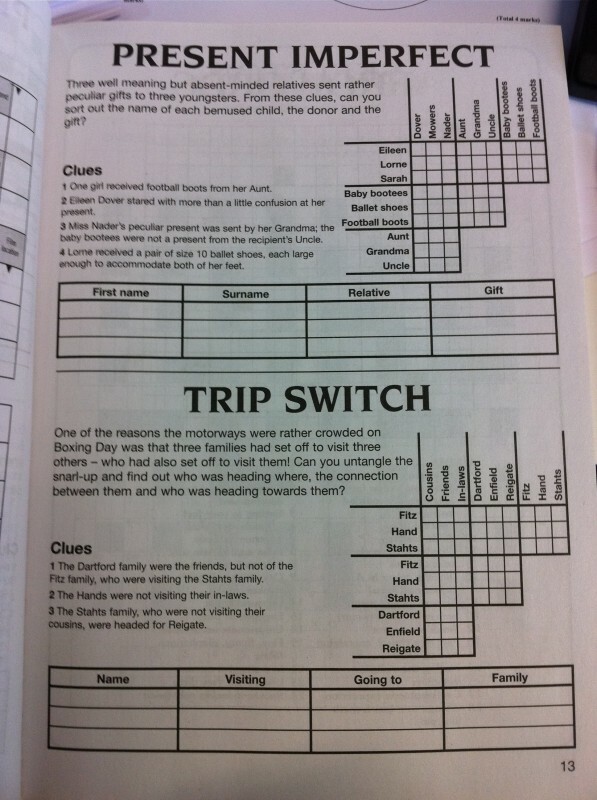 The lesson moves on to solving them and the plenary (or “Final challenge”) is to solve a wordy past paper GCSE question. I enjoy using this lesson and my pupils enjoy it, understand it and learn from it and i hope that some of you can have a similar experience with your classes. NB: I’ve also included an exported powerpoint of the notebook file. Today I decided to try look into uploading resources to the TES website. I figured that I get so many off there from such fantastic contributors (my favourite ones can be found here: https://cavmaths.wordpress.com/resources/ ) that it was about time I started to put some of my own up. Also included are the “wedding maths” starter (https://cavmaths.wordpress.com/2012/12/23/wedding-maths/) and an old favourite (https://cavmaths.wordpress.com/2013/01/29/an-old-favourite/) . I have included two show-me activities based around reflection, rotation and enlargement which i find fun and engaging. They included pictures of celebrities they will know, and some they may not know. I have found this can be a good way to get some wider discussion into the lesson, perhaps around the prime minister. I do find it slightly worrying that more pupils recognise the President of the USA than our PM! The final one I have included is a whiteboard activity called “Whats wrong with this chart”, which was inspired by a series of tweets from @nyoungmath (a maths teacher from Canada) which included the pictures I have used and the answers from one of her classes about what was wrong with them. I have used this today as a revision activity with Yr 11 and they loved working out the mistakes! Podcasts are not something I’ve really known much about before, and I’d certainly never listened to one, especially a maths one, so I didn’t know what to expect! I thought it would be similar to a radio show, and a radio show about maths was something that appealed to me, so I decided to give it a shot. The first episode (http://www.flyingcoloursmaths.co.uk/wrong-but-useful-episode-1/) was good, I enjoyed the maths chat and it gave me some food for thought. This was great and I was excited for episode two. My favourite bit was the discussion around the coolest numbers! (although 73 didn’t get a mention!) This episode also signposted me to other maths podcasts which I will investigate. When episode two came around I was amazed. The whole thing was fantastic. The improvement was immense, which is saying something because I had loved the first episode! I imagine the improvement came due to Dave and Colin having the experience of episode 1, so really can’t wait till the next. The second episode (http://www.flyingcoloursmaths.co.uk/wrong-but-useful-episode-2/) started with a theme tune, which was great, and the maths behind it was pretty interesting. The discussion then covered a few interesting topics. Colin discussed twitter and basic maths. He mentioned the fun that can be had by searching #basicmaths (it can be fun, although a lot of traffic currently about a new wordpress theme with that name!) Colin disclosed an anecdote where someone had claimed “a 110% increase”, and someone else had told them it didn’t make sense and used #basicmaths as an insult. Which is ironic, as in this context it does make perfect sense. This segment put the ludicrous idea into my head that Colin and Dave would take up a role of twitter “maths police”, spending time looking for other mistakes like this and correcting them. This idea made me giggle a lot. Who knows, perhaps it will become a segment! 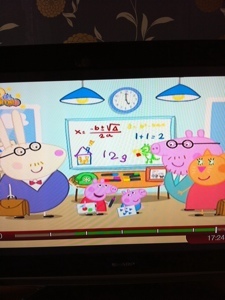 A discussion around Peppa pigs maths, inspired by this pic I tweeted! All in all, the podcast are awesome, and if you love maths, as I do, I would urge you to have a listen for yourself!